icpuScore - we calculate your marks! ICPU has come to an end, but not yet, there is still a 30% of final exam. It's too late, but not too. 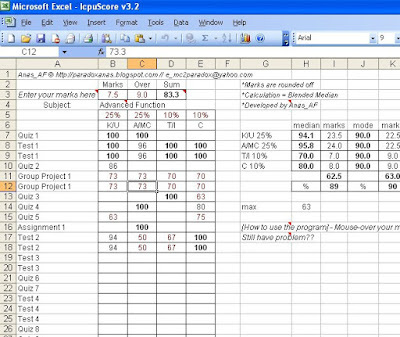 I have done the icpuScore [software] to calculate marks but some students didn't take the opportunity to use it. This is a good way to improve marks. I know my marks are also not that good but it is very good if you could estimate your course work marks. Some still don't know what is their level until the end of the course especially chemistry marks for Mr Les students. For this post, I just want to congratulate and thanks those who use the program of icpuScore (now version 3.2), and hope you found it useful. Before the start of the next semester, I'll update the icpuScore in this blog.